The KR-808 e-cigarette is a small device that competes with the L88B and 510 e-cigarettes in the “mini” electronic cigarette market. Many different KR-808 battery sizes are available, ranging from around the same length as a 100s cigarette to almost as long as a ballpoint pen. The average length for the KR-808 e-cigarette is around 10-20mm longer than a 100s cigarette when fully assembled. The KR-808 e-cigarette offers around the same vapor production as the 510 and often has better battery life. If you’re looking for a small electronic cigarette, the KR-808 is one of the best e-smoking kits you can buy. KR-808 e-cigarettes are available with automatic and manual batteries. Almost every KR-808 e-cigarette kit I’m aware of contains your choice of automatic or manual batteries. Some even include both, which is great for first-timers who may not know yet which type they prefer. Of the common small electronic cigarettes, the KR-808 is the only one designed from the ground up for use with cartomizers. You won’t find an atomizer or disposable cartridges designed for the KR-808 e-cigarette. You can find an adapter to convert the KR-808 threading to 510 threading for dripping if you wish, but you’d be better off buying a 510 battery for that purpose. The attachment threading for the KR-808 e-cigarette extends from the end of the battery, while the threading for KR-808 cartomizers is recessed. This is the reverse of the threading design for 510 e-cigarettes. The typical KR-808 e-cigarette is around 120 mm in length. I find that the KR-808 e-cigarette seems to offer slightly better battery life for its size than the 510. Since a typical e-cigarette battery drops in voltage a bit as the charge level decreases, this means that a KR-808 battery will deliver its maximum amount of vapor for more puffs than a 510 battery. While a typical small 510 battery holds a charge of 180 mAh and lasts for around 80-100 puffs, the most common KR-808 battery has a charge of 280 mAh and lasts for up to around 200 puffs. If you think you’ll be the type of e-smoker who just sticks to packaged refill cartomizers, the KR-808 e-cigarette is probably the model for you. On the other hand, the 510 e-cigarette may be a better choice if you think you might experiment with other liquid delivery methods, because so many different attachments are compatible with the threading. If you decide that you like to use an atomizer and drip tip, you can use a standard atomizer, a low resistance atomizer, a bridgeless atomizer and so on. If you decide that you like cartomizers, you can use polyfill cartomizers, cartomizers with wicks, tank cartomizers and any of a dozen or so other styles. With the KR-808 e-cigarette, you’re pretty much stuck with one cartomizer design. The good news is that the KR-808 cartomizer design — which suspends the liquid in cotton gauze wrapped around a heating coil and air tube — happens to be the best design currently available in my opinion. Most companies that sell pre-filled cartomizers — both for the 510 and KR-808 e-cigarettes — use this cartomizer design. The most popular KR-808 kits are sold by V2 Cigs. If you’ve spent any time on this website previously, you already know that V2 Cigs is the brand I recommend in my article about the best e-cigarette for beginners. 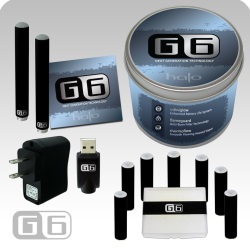 If you’re on a very tight budget, though, you might consider the Halo G6 as an alternative. With Halo, you get the benefit of an excellent selection of USA-made refill liquids. Use the coupon code VAPE4LESS to save 5 percent on any Halo Cigs purchase. The Halo G6 starter kits costs $44.99 as of 2014. It includes two batteries, a package of five refill cartridges and the accessories you’ll need to keep your batteries charged. Around the same price point is the V2 Cigs Standard Kit, which costs $50.95 with the coupon code vapegrl15. The V2 Cigs Standard Kit also includes two batteries and comes with five more cartridges than the Halo G6 kit for a total of ten. In 2012, Eddie Van Halen switched to electronic cigarettes after decades of chain smoking. His years of tobacco addiction had resulted in cancer of the mouth. Hopefully, Eddie will remain cancer-free for many years to come.